Having spent more time with the 7th edition rules and after some practice games, it's time to evaluate how my armies are transitioning to the new edition. 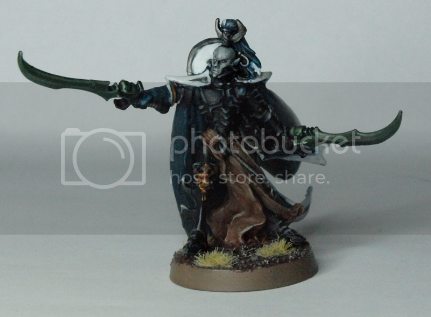 Starting with Dark Eldar. Most of the big changes that impact the dark kin have been discussed: poison taking a slight hit with re-rolls only if your strength is higher (instead of equal or higher) than your target's toughness. For the most part, Dark Eldar fare pretty well in 7th with the improved survivability of vehicles, the improvement to Jink, and of course all those Objective Secured skimmers. They wont be participating much if at all in the new Psychic phase, but there's always Eldar battle brothers if you're keen on using mind bullets plus their ability to use our open topped transports or webway portals is pretty cool. Dark Eldar still have everything that was going for them in 6th edition as far as synergy with the Eldar, great HQ options, decent shooting capabilities, and of course the almighty beast pack. I feel like 7th edition has already broadened the options for Dark Eldar, and if the rumors about a new codex in the fall are true, this could turn out to be a fantastic edition for them. I think DE can do MSU builds very well which is even more viable in 7th with the new missions. Depending on the army composition guidelines you choose to follow (i.e. multiple Combined Arms Detachments) the Dark Eldar can build lists they otherwise would have only been able to do in apocalypse matches; true coven lists with several talos / cronos (who usually never see the table because of competing with Ravagers and our only flyer / anti-flyer options in a very limiting Heavy Support FOC). The Serpent, Duke Sliscus. The Duke wasn't a bad HQ choice before 7th edition but to get the most out of him you needed to run a list that made the most of his army benefits, either a lot of units with combat drugs or a huge warrior/trueborn squad to take advantage of 3+ poison. Now, thanks to the subtle changes to Deep Strike, there is another big draw to taking the Duke: Low Orbit Raid (LOR). LOR provides all Raiders, Venoms, and Ravagers in the same army as Duke with the Deep Strike special rule. Not only does this save 5pts per ship not needing to purchase Retrofire Jets, but now you have even more tactical options for alpha strikes or grabbing critical objectives. The big change is on page 162 of the rulebook, almost dead center of the Deep Strike section: "...Deep Striking units may not move any further, other than to disembark from a Deep Striking Transport vehicle if they are in one. "After disembarking, the unit can then fire, run, turbo-boost, etc. This is huge, as before you would have to sit tight in your paper airplane for a turn hoping to not get blown up; now you can land, jump out, and potentially move up to 12 inches from the ship to grab an objective, move into cover, and generally get out of harms way (i.e. exploding vehicles). Taking this a step further, being able to jump out multiplies the number of targets your opponent needs to focus on, since now your unit and its dedicated transport both have Objective Secured and both need to be dealt with. Plus you can maximize the threat of those empty Raiders by purchasing a few upgrades. I'm playing around with the following configuration: Enhanced Aethersails for the extra 2D6 movement, Shock Prow for Tank Shocks/Rams, and Torment Grenade Launchers to increase the chance of failed Leadership checks. I'm sure there are other combos to try as well, but so far I love the tactical flexibility that this change brings to the game. And with that, I think we'll be seeing a little more of this guy. I'll post up some of my list ideas and how I plan to take advantage of some previously under-used units from the Dark Eldar codex. Let me know how you are running your Dark Eldar in 7th edition!